When you're on the dance floor wearing that bold looking light blue suit, you can't forget about what you're going to wear on your feet. 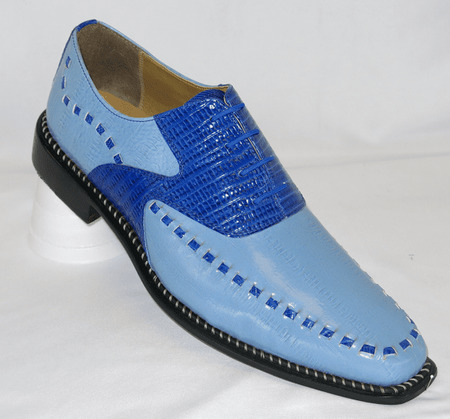 You need a bold looking pair of dress shoes like these light blue and royal dress shoes. If your suit is a light blue gangster stripe pattern that is a bold looking suit and by wearing a pair of matching shoes you will be assured that you'll look the part on the dance floor or stage providing maximum visual impact.